In the world of advancing medical technology, sometimes we lose sight of the simple things we can do to protect and nurture our bodies. There are actually cancer fighting foods at our fingertips. Foods that many of us never give a second thought to. Oh, we know that saturated fats and high fructose sugars are no-nos. But what about foods that can actually protect and often slow some of the damage to our health? Specific foods. Cancer fighting foods. 1. Aloe Plant Juice - this food source originally comes from Ecuador and has been shown to slow the growth of leukemia cells. We don't have any aloe plants growing in our backyard, but we did find the juice at our local health food store. It is a clear juice, but VERY tart/bitter. We found it unpalatable by itself, even over ice. However, when mixed with other juices, the taste was almost unnoticeable. 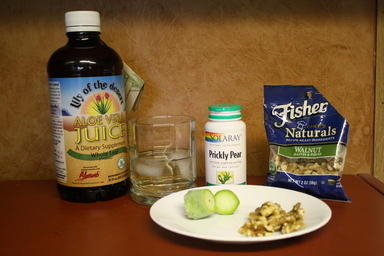 The aloe juice product we are using recommends adding 2 oz to your daily diet. Very do-able. 2. Bottarga - this product comes from Sardinia. Research has shown it to slow the growth of colon cancer cells. It is basically salted, pressed and cured fish eggs. I'm almost relieved to tell you that we couldn't find any Bottarga locally. And, yes, I really, really looked. I am currently checking online markets and will report back when we've actually taste-tested this super cancer fighting food! 3. Prickly Pear Cactus - this food treat is from Arizona and can be used fresh in salads, or made into jellies, smoothies and shakes. It has been found to slow the growth of many cancers, including ovarian, cervical and bladder. Our local health food store did not carry fresh cactus pears, but offered a capsule form of the pear leaf extract. 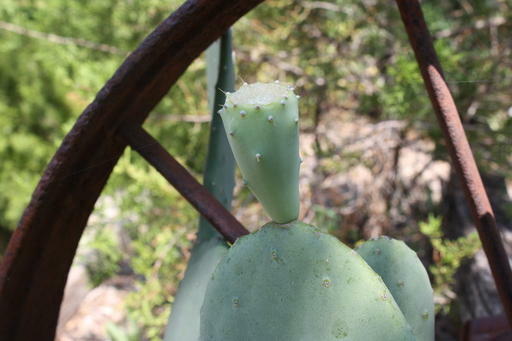 Much to my delight, I did have one prickly pear cactus in the yard and it had one, solitary, little pear fruit. 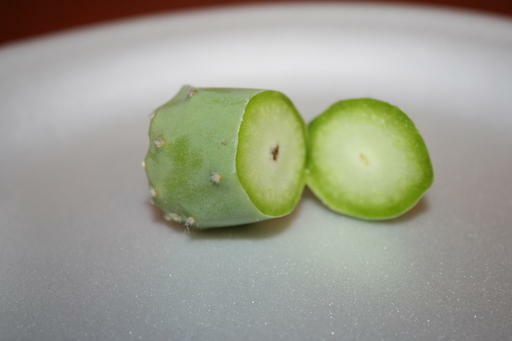 However, upon slicing it open, the fruit was very green. I will have to work on patience in my harvesting skills. So, we didn't get to try fresh cactus pear. Our experiment was with the cactus pear capsules. The company recommends 1-3 capsules daily. Again, very do-able. 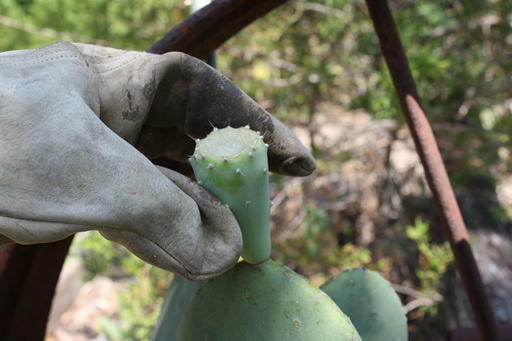 Caution: Be sure to use heavy gloves when harvesting cactus pears! 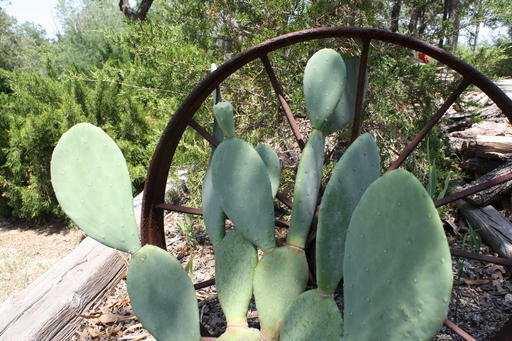 My Prickly Pear Cactus Plant. with it's one solitary cactus pear fruit. Advance on the fruit carefully, fully gloved up. And the harvest is early! Fruit is still green. Drats! 4. Walnuts - Perhaps my favorite of the 4 foods on Andrew's list! And he hates them. Go figure! Nuts have always been well-eaten in our family. Of course, my favorite is the cashew (sweeter), but the walnut is fast becoming my next favorite. It has the most antioxidants of any nut. Very easy to add these to our daily diet. In researching Super Cancer Fighting Foods I ran across 2 very promising nutritional studies. One is researching the potential benefits of The Ketogenic Diet in conjunction with standard chemo/radiation therapies. And another is the study of Angiogenesis. The Angiogenesis Foundation is currently working on a new project entitled "Eat to Defeat Cancer." The premise of their research is this: All cancers require the growth of new blood vessels, called angiogenesis, to grow beyond a few millimeters in size. Like healthy tissues, these blood vessels supply the tumor with critical oxygen and nutrients. A major treatment advance in recent years has been the development of drugs, called angiogenesis inhibitors, that interfere with the tumor blood supply. One of those drugs is Tarceva. It is one of the anti-angiogenesis drugs targeting pancreatic cancer tumors. It is usually paired with Gemzar as a chemotherapy treatment. Not all studies show it is successful, and mom's oncologist removed it from the treatment and put her strictly on Gemzar alone. But other studies show some improvement with Tarceva. Perhaps it depends on how sensitive the tumor is to the drug. For more information on this topic here is a link to an article on What you can Eat to Defeat Cancer. And here is a more lengthy video of the President of the Angiogenesis Foundation explaining the concept. The video is approximately 24 minutes long and can be seen by clicking on Dr. William Li's 2010 TED Talk. While the subject of super cancer fighting foods is an exciting field, I must caution that as always, you should check with your health care professional before drastically changing your diet or nutritional intake. Some foods do interact with proven medical therapies, and our motto with any addition to our regimen is "first do no harm." That being said, we are adding some of these nutritious foods to mom's pancreatic cancer diet. We continually research each suggestion. I am particularly looking forward to finding out how chocolate can defeat cancer. I always knew it had to be good for you! !